No one does Australian Gothic quite like Rosalie Ham. Her sun-soaked revenge fantasy, The Dressmaker, captured a particular side of rural Australia – one steeped in malice, jealousy, bitter rivalries, and tightly held grievances. 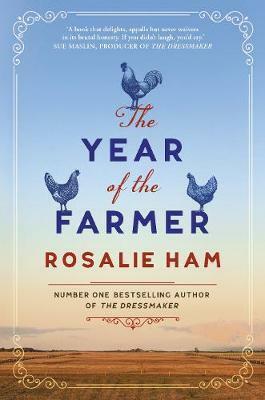 It’s to this world that Ham returns in her new novel, The Year of the Farmer. The residents of a tiny NSW country town are at war: Townies versus Farmers, Ferals versus Riparians, and everyone against an unsympathetic and corrupt local Water Authority Board. Mitch Bishop comes from a proud line of farmers who have been growing crops and raising sheep at Bishop’s Corner for over a century, but it’s starting to feel like he might be the last. Nothing seems to have gone right since his childhood sweetheart left for the city; and now between the packs of wild dogs slaughtering his lambs, the uncooperative weather, the scheming wife, and the increased demands of the State Water Authority, Mitch is barely surviving. But there’s a change coming, and nothing is going to be the same again. The Year of the Farmer captures that brittle, brutal feel of a community on the edge of extinction perfectly. It’s a place where death and decay go hand-in-hand with rebirth; where blood might be thicker than water, but you can’t water your crops with it. The Year of the Farmer also boasts one of the most satisfactorily loathsome villains I’ve read in a while, and as the story accelerated towards an explosive showdown, I was rubbing my hands together waiting for them to get their comeuppance. Ham’s talent for black comedy and satire shines through the narrative, and her grasp on the rural existence puts readers smack-dab in the middle of the oncoming storm, the stink of sheep and dust and spilled beer permeating every page.